The Turner and Wordsworth connection. John Mallord William Turner (1775-1851). In 1816, through the doorway appeared a small middle aged man engaged in one of his famous sketching tours. Joseph Mallord William Turner, Britain`s greatest watercolour artist, Father of Impressionism, stayed here for three days completing four drawing of Mossdale Head, and two sketches of Hardraw Force one of which he `worked up` into the finished painting now hanging at the Fitzwilliam Museum, Cambridge. 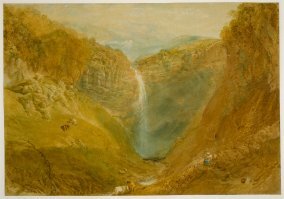 J. M. W. Turner was a preeminent English landscape artist whose dramatic renderings of light and atmosphere greatly influenced the Impressionists. Turner was born in London, England, where his mother died when he was very young. His father was a barber who exhibited Turner's earliest artistic efforts in his barbershop window. Turner studied at the Royal Academy of Art in London, where he had the rare distinction of having a painting exhibited when he was just fifteen. Turner quickly achieved success with his dramatic, airy landscapes and seascapes. His early paintings were watercolors, but by the late 1790s he had switched to oils, though he retained the vibrant color of his earlier work. Turner traveled widely in Europe seeking inspiration and subject matter, sometimes taking such great artistic license in depicting scenes that they were virtually unrecognizable. Turner exhibited at the Royal Academy of Art throughout his life until shortly before his death. 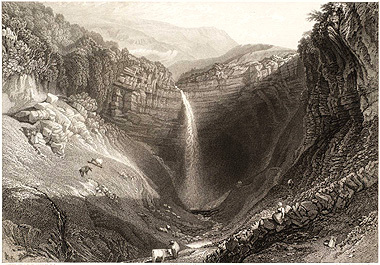 William Wordsworth mentioned Turner`s `fine drawing` in his Guide to the Lakes. One can imagine his pleasure at recalling his experiences by retracing his footsteps through Turners engraving. "Twas bitter cold, the wind driving the snow behind us the the best style of a mountain storm. We soon reached an inn at a place called Hardraw, and descending from our vehicles, after warming ourselves by the cottage fire, we walked up the brookside to take a view of a third waterfall, . . . . .
We walked up to the fall; and what would I not give if I could convey to you the feelings and images which where communicated to me? After cautiously sounding our way over stones of all colours and sizes, encased in the clearest water formed by the spray of the fall we found the rock, which had before appeared like a wall, extending itself over our heads like the ceiling of a huge cave, from the summit of which the water shot directly over our heads into a basin, and among the fragments wrinkled over with masses of ice as white as snow, or rather, as Dorothy said, like congealed froth. The water fell at least tens yards from us and we stood directly behind it." The poet William Wordsworth was born in 1770. By the time of his death in 1850 he had produced some of English poetry’s greatest works and influenced future generations of poets. Most of his life was spent in the Lake District. He was born in Cockermouth (a town in the northern Lakes); educated at Hawkshead Grammar school; and spent much of his adult life in Grasmere and Rydal, right in the heart of the Lake District. He died at Rydal Mount in 1850, and is buried, with his family, in Grasmere churchyard. He was witness to great social, political and artistic change and his experiences and attitudes are reflected not only in his poetry, but also in letters and prose works. Place and family were also important to Wordsworth. This is clear in his abiding love of the Lake District and settled domestic life, celebrated in poems such as ‘Home at Grasmere’.